In the last installment we looked at how you should use the auctioning capabilities in TSM to easily and quickly post your items to the auction house. Today I will go into the other side of the AH, which means the shopping side of TSM. First We will take a look at the shopping UI. When you open the auction House UI and navigate to shopping you will see the UI in the screenshot below. 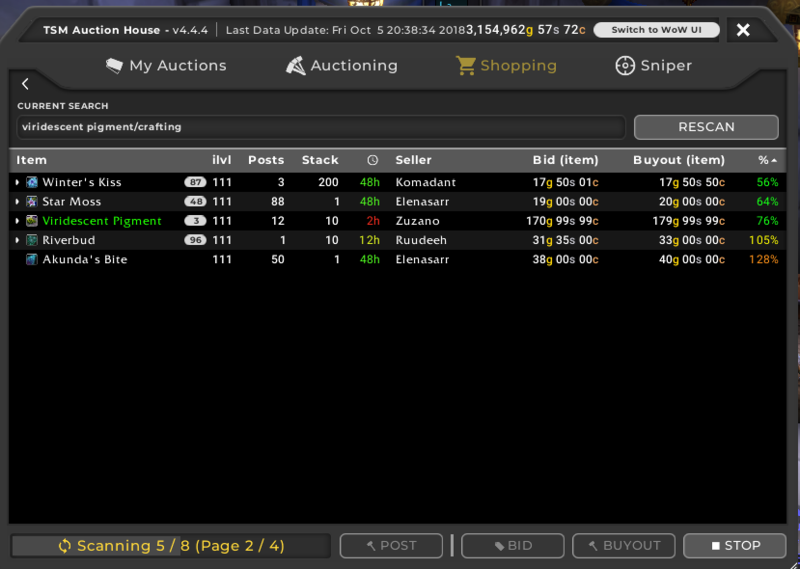 It looks quite similar to the auctioning UI and there are a lot of similarities in functionality as well. The left hand pane has all your groups that have an assigned shopping operation. This functions exactly like auctioning scans. Then on the right you can use search strings. This can be names of items or more sophisticated search strings. The search field here will function very much like the normal AH search. This is by far the simplest way to shop for items. You can type in an item name in the search bar and TSM will search the AH for any item with the string in it’s name. Below I have searched for Living Steel and we see all the items with this in the name. The results UI is for the most part quite self explanatory. It shows the item level, number of auctions, number of items per stack, the bid price, the buyout price and the max price column at the right. The maximum price percentage column is the most important one. It shows you how the price compares to your defined maximum price. The default for the normal searches is a max price of dbmarket. 100% in the max price column represents 100% dbmarket. Obviously you want to buy items below dbmarket whenever possible. You can change the maximum price for your shopping searches on the settings pane under shopping if you want to, but for most markets dbmarket is likely the optimal choice. Crafting searches are an alternative to normal searches. Crafting searches are only defined for some items. If you use a crafting search TSM will look for the item you search for as well as the materials required to find the cheapest way to purchase it. The most prominent use case is for milling. You can run a crafting search for viridescent pigments and it will compare the price of herbs to the milled pigment price to show you the cheapest alternative. For these searches the maximum price will be dbmarket for the item you are searching for. As shown below the price of pigments is below dbmarket, but the herbs are an even cheaper source of the pigments. The search box can be used with specialized search strings as well. These can be used to activate the filters from the base UI. You can filter on things like item type, rarity, item level etc. Two good examples include using /Battle Pets which searches the AH for all the battle pets posted and /Epic/120/i370 which will search the AH for all epic items that have an item level of 370 and higher and a minimum level of 120. Both your search strings and your normal item searches will show up in your recent searches and you can click a search there to run it instantly. You can also click the star to favorite it. This will let you access it from the favorite searches view. For operation based scans you want to choose which groups to scan for. You generally want to limit the size of your scans to make sure you can quickly snag up any deals. The main difference between operation based scans and search strings and normal searches is that you can choose your maximum price separately for each item. The maximum price is the main thing you define in your shopping operations. 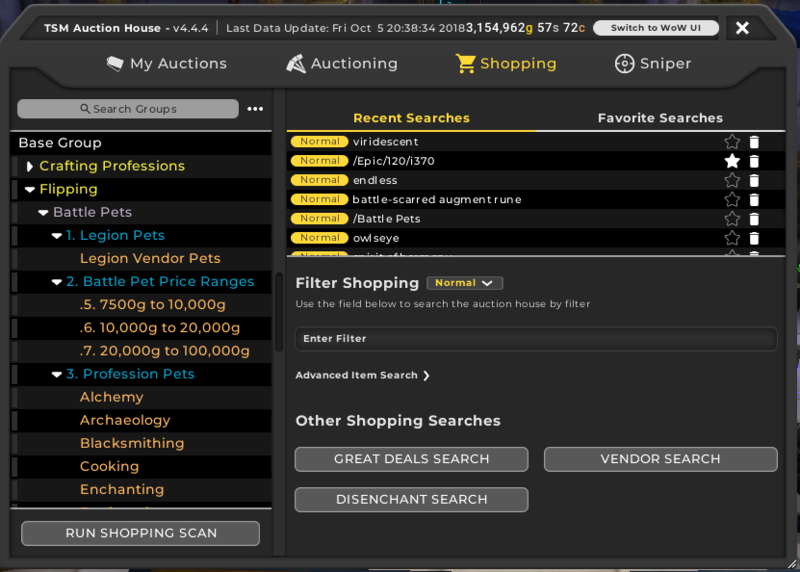 There is one other setting you can use for operations, and that is to hide auctions above your maximum price. This can be very useful if you want to quickly buy everything below your max price. If all the other auctions are hidden you can just run your shopping macro like a madman and you won’t be in danger of buying something you don’t care about. 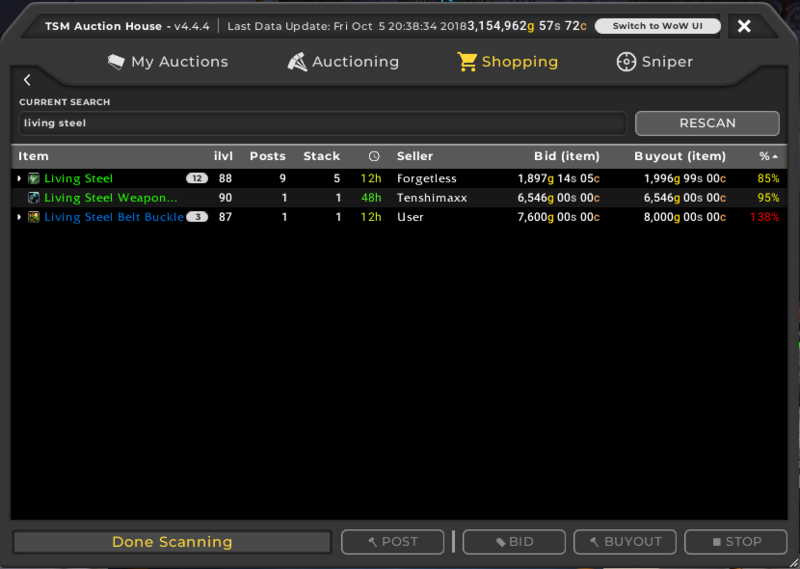 Showing auctions above maximum will let you get a better view of supply on the AH on the other hand. I prefer showing auctions for stuff like material flipping, where the supply is very important. For battle pets I hide all auctions above max to buy up everything I want more efficiently. To buy auctions you simply click the first one on the list you want to buy. Then you use the scroll wheel macro we setup in the last part of the guide to start buying. The macro will purchase auctions without confirmation, so be careful. It’s very easy to spend gold this way! The UI will only show you the per unit price when buying large stacks. For those of you with little capital this can be an issue, but over the long term you should only really care about the per unit price, as this is what ultimately determines profitability. The different shopping scans have slightly different use cases. Normal scans are often quicker to execute, and do not require any setup. Shopping operations allow you to customize your max price and setup customized scans by picking a combination of groups. Changing the maximum price can be extremely useful, either if you want a more complex price or if you just want to hide auctions above max price. It’s also awesome for getting a better view of how your AH compares to your prices. So let’s look at two case studies. My material flipping operation has a shopping operation with a max price of 80% dbmarket. It is set to show auctions above maximum price. The max price of 80% dbmarket makes it very easy to see what auctions I want to buy. 100% in the max price column has one more digit than anything below, so it’s easy to see my cut-off at a glance as show below. 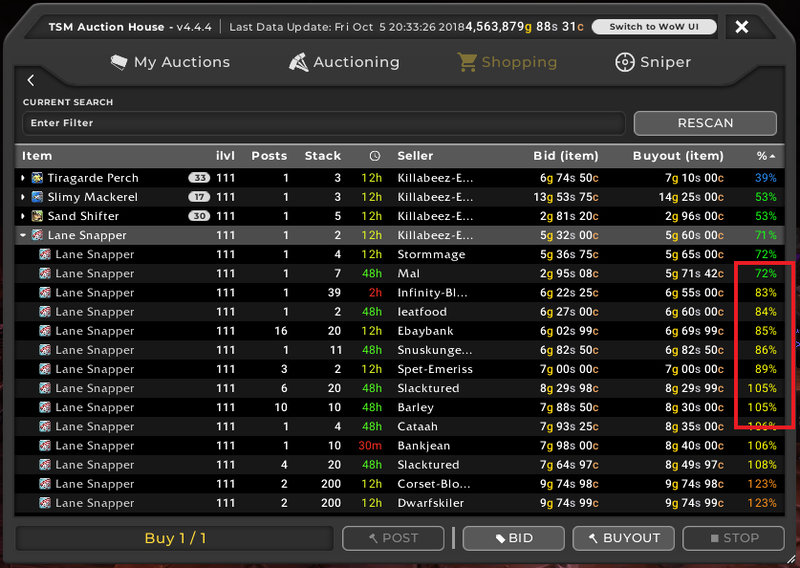 By showing all the auctions I can also quickly check if the AH is oversupplied. If there are 100 stacks of 200 at 110% of my max price I won’t be buying up stock, as my minimum price for posting is 100% dbmarket which will show up as 125% of my maximum price. In this case it’s extremely unlikely my auctions will sell. Run a scan. 100% is my cut-off, stands out nicely as it’s three digits. Show above max so I can see if supply is too high for it to be profitable. For BoEs I use the search string I showed you above under the search string heading. There are way too many variants of BoEs with rare combinations of bonus IDs to buy in this market with an operation. For this market I find it’s optimal to set the maximum price to dbregionmarketavg. I generally prefer to buy these at 50% dbregionmarketavg, but your mileage may vary. Using a search string will find all the items. I have to make my own analysis by looking at the AH to figure out if there are any deals though as my setup is too generic to trust it without oversight. Hopefully this has given you a decent understanding of shopping scans and how you use them. This is where you will make most of your gold as a substantial part of AH based gold making is to find good deals. Executing lots of shopping scans is very important. Good stuff! Thanks for explaining what the % means in TSM. So, essentially, I should be looking at stuff equal to or less than 80%?! The /crafting portion was a bit confusing for me. I’m a tailor looking to craft bracers and disenchant them for gold. Should my search command be Tidespray Linen Bracers/crafting ? What you are looking for depends on what you’re planning to do. I buy below 80% dbmarket for flipping markets. For crafting searches it will compare the price of bracers to the price of cloth. You can just choose crafting from the drop down menu just above the seach field, no need for a string. 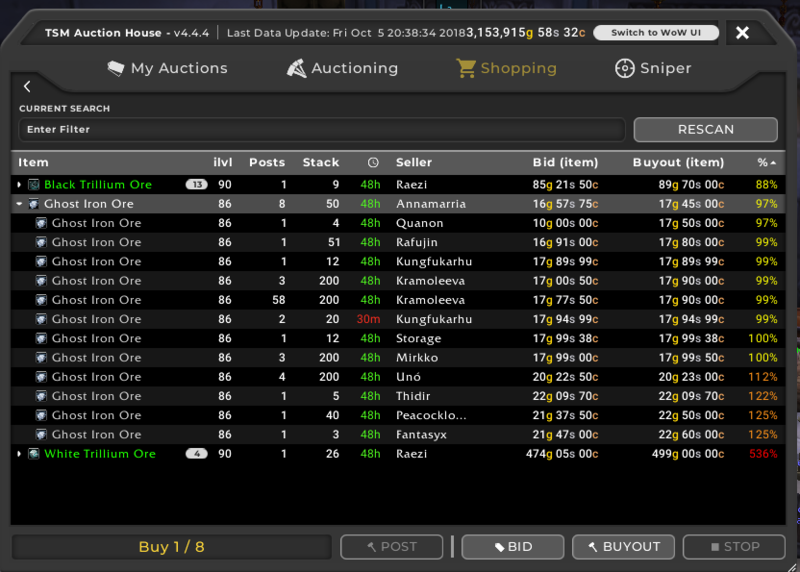 -By showing all the auctions I can also quickly check if the AH is oversupplied. If there are 100 stacks of 200 at 110% of my max price I won’t be buying up stock, as my minimum price for posting is 100% dbmarket which will show up as 125% of my maximum price. In this case it’s extremely unlikely my auctions will sell. What is my max price in this case? Why my 100%dbmarket will show up as 125% of my maximum price? The percentage column is based on the maximum price in your shopping operations. In this case the max price is 80% dbmarket so the percentage is in relation to that. 100%dbmarket is 125% of 80% dbmarket. The max price is always 100% in a shopping scan. If you multiply all the percentages on the results pane by 0.8 you will get the percentage of dbmarket. Hi, thanks for the massive work you’ve done! My problem is: TSM doesn’t display the percentage after a shopping scan! How can I solve this? Have you setup the desktop application to keep your AH data fresh? That’s the main reason I can think off. If you auction house database doesn’t have the price values in it then the percentages won’t show up.